Ballpark Basics: An Olympic stadium retrofitted into a classic American ballpark. 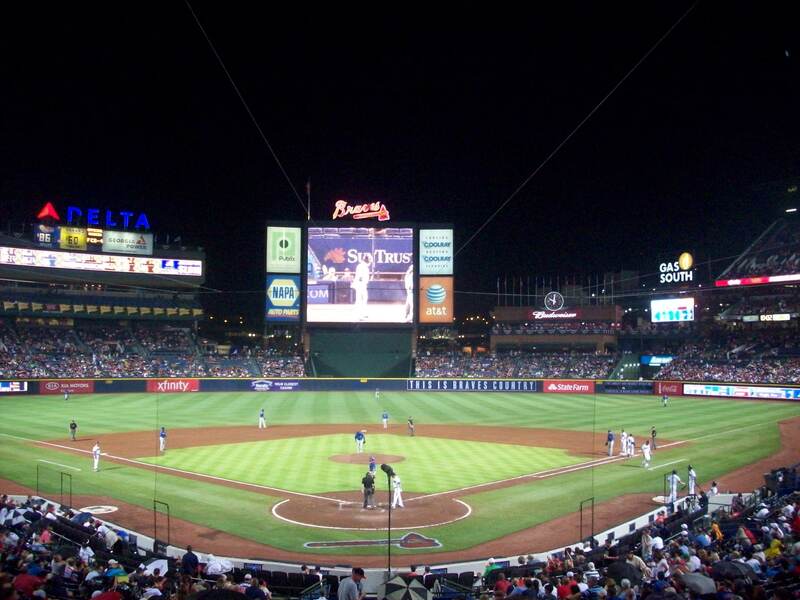 Ballpark Breakdown: We called on our local friend Jason to see if he would be interested in heading to a Braves game with us during our brief visit to Atlanta. Being a huge Braves fan, he readily agreed. 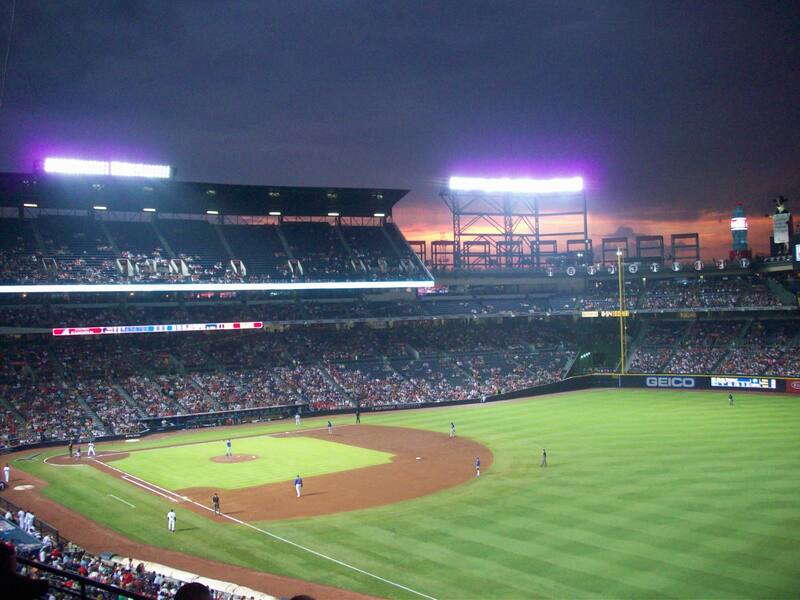 Luckily for us, Braves tickets are not hard to come by. The fans of Atlanta are notoriously fickle and Braves fans might be known more for not selling out playoff games than anything else. We ended up scoring four seats in the 755 Club for well below face value (on a firework night no less). Sometimes an apathetic fan base can be a good thing. We hopped on the MARTA heading for Turner Field (or The Ted as it is affectionately called by the locals). 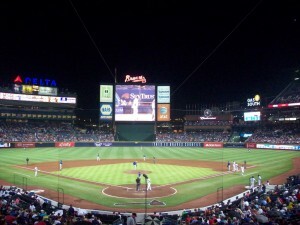 It’s an easy ballpark to get to by mass transit with a Braves Shuttle that drops you off right outside the gates. 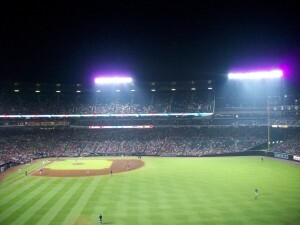 While the stadium is surrounded by parking lots, driving in the Atlanta metro area can be a challenge and getting to a game is no different. Walking in on the field level, it has a closed concourse and it feels very claustrophobic with low concrete ceilings and small tube TV’s showing the action on the field. When you get to the terrace level the concourse opens up and you can watch the game as you travel around for your food or drinks. We made our way up to the 755 Club (which is the Club Level named after the final number of home runs that Hank Aaron hit). The 755 Club is not the only notion to the past at The Ted. The Braves have a long and storied history and they are clearly proud of it. If you enter the stadium from the main gate in center field (which we highly recommend) you will see Monument Grove. 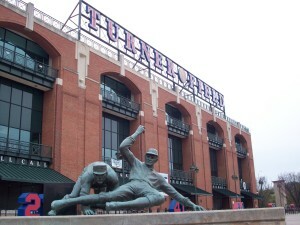 Here you will find the retired numbers for all of the former braves as well as statues depicting Hank Aaron, Phil Niekro, Warren Spahn, and Ty Cobb (not actually a Brave but from Georgia). Along the wall of the ballpark is a mural that states the Braves as “the longest continuously operating franchise in Major League Baseball” with a chronological list of all of the different incarnations that team has been through starting with the Boston Red Stockings in 1871. The Braves Hall of Fame is located next to the main gate and includes artifacts from all of the great Braves players as well as the World Series trophy from their 1995 title. Also throughout the ballpark are murals and banners highlighting important moments in the team’s history. 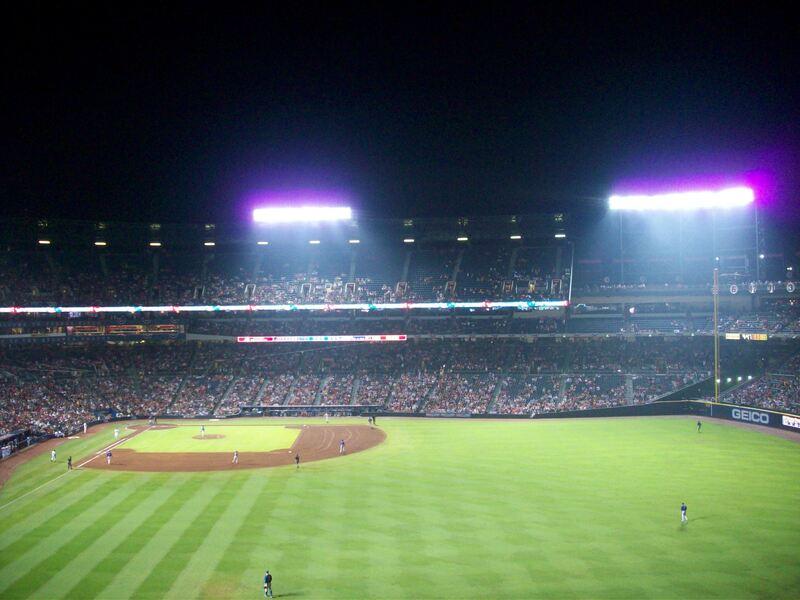 One of the best nods to the team’s history isn’t even in Turner Field. 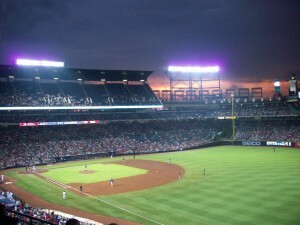 The parking lot next to The Ted is the former location of Fulton County Stadium. Here you can find the outline of the original baselines. However, the best part is the marker for where Hank Aaron’s record breaking home run ball went over the fence. Here they left a portion of the original fence with a plaque for the historic 715. This is easily one of the coolest historical markers that we have seen and worth the short walk through the parking lot. As we mentioned above, Atlanta is notorious for having a fair weather fan base and the game that we attended didn’t do anything to assuage this belief. However, one area where the fans truly shine is during the Tomahawk Chop. They play the music relentlessly throughout the game, even for the most mundane situations. Bloop single. Tomahawk Chop! Sacrifice Fly. Tomahawk Chop! When you finally settle into your seats and take a look around it is hard to imagine that this is the same stadium that housed the track and field events during the 1996 Summer Olympics. You would think that this place has always been a baseball-only facility. 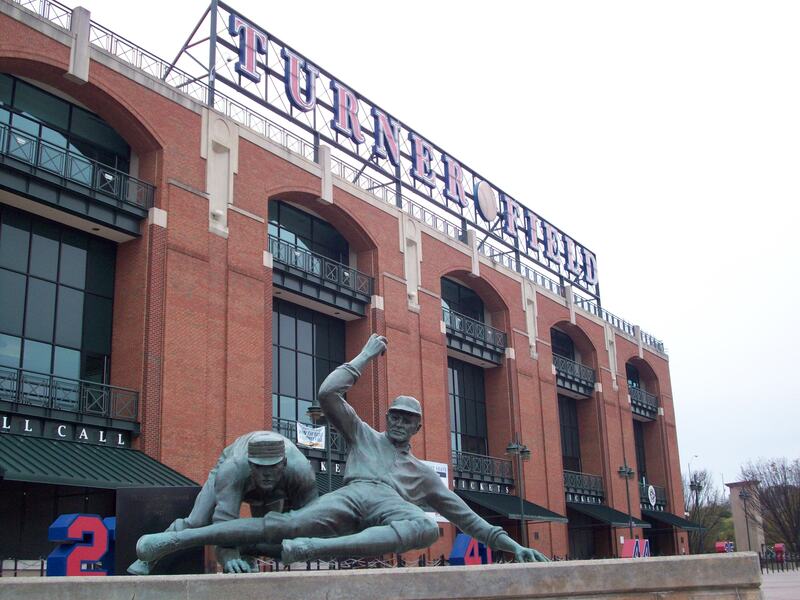 Named after the team’s former owner and media mogul, Ted Turner, “the Ted” fits in perfectly with the retro ballparks built around the same time period. The backdrop opens up and gives you a great view of downtown Atlanta. Looking around there are a couple of things that differentiate this place from other ballparks. Above the left field bleachers they have the flags for the pennants that the Braves have won. It is quite a sight to see the flags from 1991 to 2005 and reminds you of what a dominant team they had (at least during the regular season:)) There are also to gigantic nods to local establishments: a huge Coke bottle that lights up and an enormous cow with a Braves hat for the restaurant chain, Chik-fil-A (that started in Atlanta). While you can find craft beer sprinkled throughout Turner Field your best option is in the outfield pavilion. 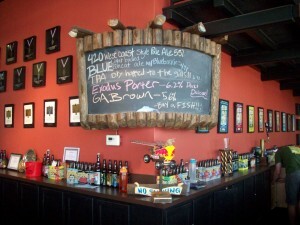 Here you will a beer station call Beer Island that is stacked with craft beers. 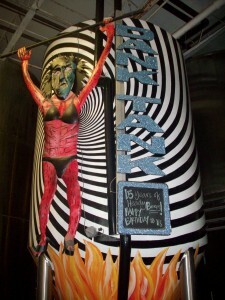 The four-sided refrigerator can take people from any direction and offers beers from local breweries such as SweetWater and Brick House as well as other craft varieties. On top of that they have two beers that are only available at The Ted: Tomahawk Amber Ale and Tomahawk Lager. However, these are both produced by Anheuser-Busch and the only reason to drink them would be to add some additional unique beer totals on Untappd. An area where this ballpark really stands out is in the workers. You know that you are in the south when you are wearing the opposing teams gear and the ushers still call you ma’am and sir. They were extremely helpful throughout the game telling us some of the best places to watch the game from and thanking us for coming and supporting their town. With a history as rich as the Braves it is nice to see them incorporate much of it throughout the ballpark. Couple this with some of the nicest staff that we have encountered at an MLB park and Turner Field a great place to visit. Brew Basics: This is a clear winner that is growing by leaps and bounds, and believes one crucial element to great beer is freshness. 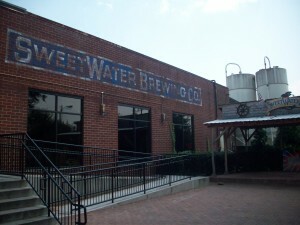 Sweetwater may be based in Atlanta but there’s a good chance you’ve heard of them. Currently the largest brewery in Georgia and the 24th largest in the southeast, they view the map of the US like a cell phone coverage map. Target the areas that don’t have coverage, and get them on board. They are targeting the Southeastern region right now and can be found south of Atlanta through Florida, North through Virginia, and as far west as Tennessee. Not bad for a company that was just started in 1997. Having friends in Atlanta, we were told that Sweetwater always appeared to be bustling, so weren’t sure what to expect when we stopped by unannounced and started asking questions. Fortunately, the staff is friendly and hospitable, and we were welcomed. Graciously given an excellent tour by Derek who (at the time) had been there just about 6 months but knew a lot about the company and was happy to show off the building. And rightly so; their facilities are amazing. A huge building that houses has an open office area, lacquered wood floor and lots of rooms. At first glance, the entrance is that of a major corporation, lobby, front office staff, and stairs leading up to the executive offices. A huge tasting room off to the side dispels the notion of “typical business”. The tasting area is its own huge room with a bar made of stone and is just on the other side of an outdoor bar with a place for a band. 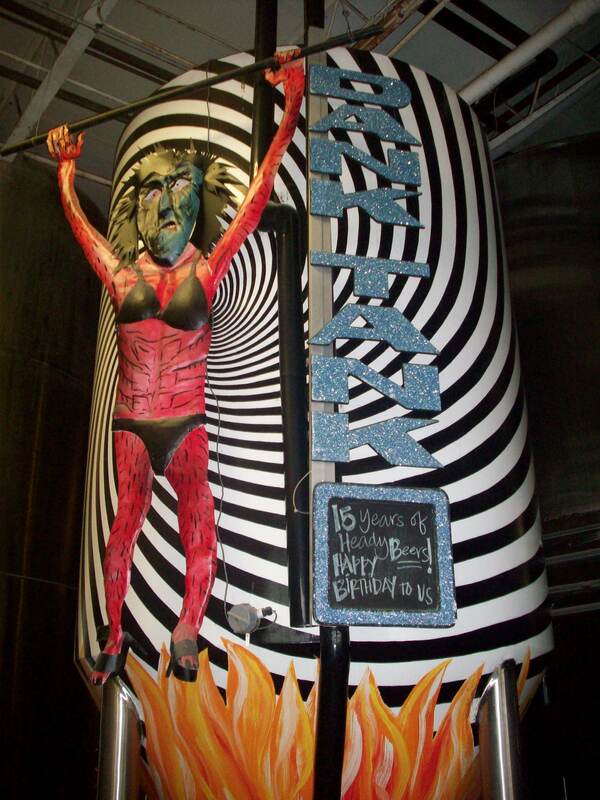 It can be rented out for events, and includes something Sweetwater refers to as the Danktank, where you can check out their fishing calendar, which is actually their brewing schedule and is also found online, here. While in this spot you can have a chance to try 1 or 2 of their one-offs. Give those a try and let them know your opinion; you never know what might end up in bottles next. Through the tasting room you can also get to a large outside patio with its own 6 tap bricked in bar area, and place for a band. From what we saw, and were told it doesn’t seem to matter the weather, this outside bar is always packed and like the rest of Sweetwater, quite popular. As mentioned this is a big operation, but their popularity means that they’re running their brew kettles around the clock to keep up with demand. When we were there they were still catching up as construction wrapped, and were in the process of upgrading to a huge 1000 barrel (which = 2000 kegs) tank that they purchased in Brazil, brought in to Jackson by ship and then had to be picked up. 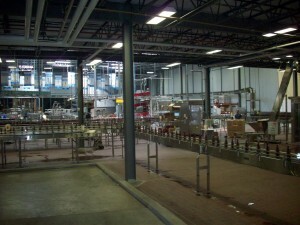 After bottling, their airplane hangar sized refrigerator will only house a beer for 2 – 3 weeks before being shipped out. Although the beer really doesn’t go bad, every beer is unpasteurized and best when fresh so Sweetwater has a date on every beer label, and will even switch out any for their restaurants/distributors that don’t sell in time. 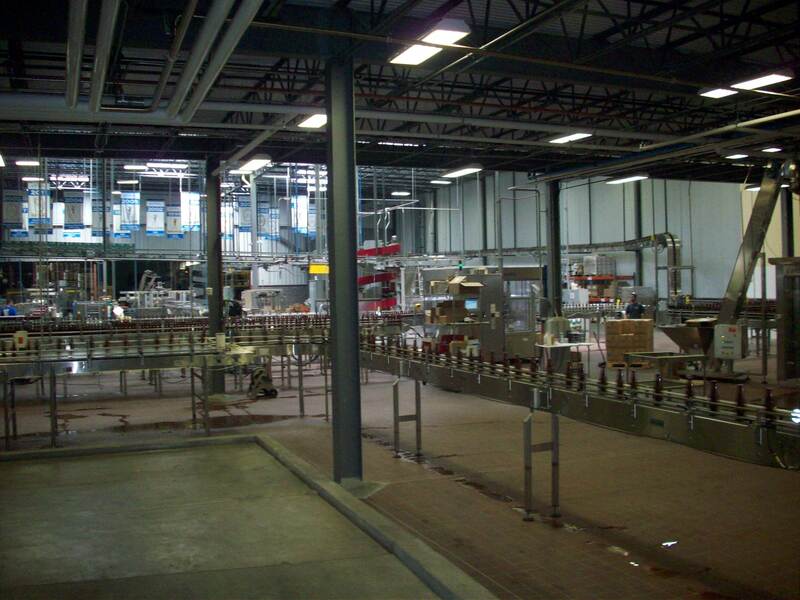 This goes for kegs too, and their kegging line which is also state of the art, will purge, clean and fill in 60 seconds. The key here is getting the freshest beer possible into the hands of the consumers – we were even allowed to grab one of the bottles with special red, white and blue on the first day of production (July 3) right off the bottling line before it even had time to be labeled. A highlight of our trip, to be sure. Blue (4.6% ABV)- With the tagline “They ain’t just for breakfast anymore” have a Blue which the brewers will tell you has a “subtle blueberry aroma” but really carries a strong berry scent that will bring to mind blueberry muffins. We weren’t sure about the potential of this one base on past berry-beer experiences. It turned out to be a unique entry into this style, peachy/apple juice in color and though you could definitely taste the fruit, the palate proved to be more understated than the bouquet; possibly because this beer was so highly carbonated that the fizz tended to block the flavor at the start of a sip. Also setting this one apart, is that most berry beers tend to be of the hefeweizen or wit varieties, but this one was filtered and almost clear of debris. 420 (5.4% ABV) – Another example of how Sweetwater differentiates themselves from the masses of breweries, the 420 is the flagship of Sweetwater. It can be found everywhere in this city, and we even heard it referred to (more than once) as the “Bud[wieser] of Atlanta”. While most breweries use a traditional lager, ale or – if they’re feeling adventurous – a brown to be their flagship, the 420 is a wheaty California style extra pale ale. It smells like hops and grains but isn’t earthy and pours like a true ale in color with orange-y brown hues and is a lot hazier than the Blue. The flavor is very wheaty and a bit dry with a handful of hops thrown in to boot. Still this is a pretty plain beer, or rather a pretty standard beer, and perhaps that is why it has helped propel this brewery toward its current success. IPA (6.3% ABV) The Sweetwater IPA is a deep caramel color with a smooth, strong aroma that smells good and is just a little sweet. The hops are pronounced as they should be, but this is a well-hopped beer as opposed to a hoppy beer. The hops are balanced and apparent throughout and impart good flavor without overly bittering the beer. It’s not a total palate killer like some, and because of that you can really taste the flavor in every sip. Georgia Brown (5% ABV/ 24 IBU) The Georgia Brown is as you’d expect, a sweetie. Made up of half a dozen grains that combine to impart a somewhat nutty palate. Sweetwater’s brown ale is full bodied with a palate that swirls of brown sugar and carmel to make this brown ale an easy drinker. Not at all heavy, but flavorful to be sure. Exodus Porter (6.2% ABV/25 IBU)- This root beer colored porter holds the distinction of being Sweetwater’s most decorated beer, and -interesting sidenote – was first brewed on Bob Marley’s birthday. The aroma that first hits is that of coffee, and this also is the first taste you will note, followed by a hop body that returns to a smooth chocolate aftertaste.